He says: When I received my samples of the latest Parfumerie Generale creations, the scent that I just had to test first was Iris Taizo, a blend of woods, iris and cardamom. I wasn’t disappointed. Let me start by saying that Iris Taizo is not a scent that showcases the pretty, floral tones of Iris as do scents like Acqua di Parma Iris Nobile or Miller Harris Terre d’Iris. Taizo is instead about aromatic woods and resins, and it’s here where the scent is most successful. The iris in question is a suggestion, a hint, threaded throughout the composition, helping to create a silky, sweet, warm aroma, slightly masculine yet soft and subtle. Personally, I would have enjoyed a stronger presence of iris, the kind of buttery, earthy tones found in Hermès Hiris and Prada Iris, along with a greater presence on the skin. Compared to many of my favorites, Taizo has a simplicity and quiet attitude that might be perfectly suited for some; though I usually prefer my scents to be a bit bolder, I would gladly wear this anytime. Overall, Iris Taizo feels like a warm, ambery oriental reminiscent of scents like Calvin Klein Obsession for men and Must de Cartier (for men). She says: Iris Taizo starts out rather dark and dry, with heavy woods and a nice dash of cardamom, one of my favorite spices. The early stages strongly recall some other perfume that I just can't place in my mind, and it has been driving me crazy for days: do comment if you have a suggestion as to what it might be. Unlike Marlen, I find the iris here to be considerably more than a suggestion, although as it is blended here with darker, heavier notes, he is right that it isn't quite the focal point of the fragrance. The iris intensifies as it dries down, as does the sweetness; the end result smells like caramelized burnt wood with a healthy dusting of powder. If that appeals to you, by all means try it — it has received good notices on the fragrance forum at MakeupAlley, and Marina at Perfume Smellin' Things loves it. I find it somehow oppressive, and the longer it is on skin (the lasting power, by the way, is excellent), the more it annoys me. I will stick with my cool, earthy iris favorites: Hiris, Bois d'Iris, L'Homme de Coeur, Three AsFour and Iris Silver Mist. Iris Taizo is available in 50 and 100 ml bottles of Eau de Toilette. 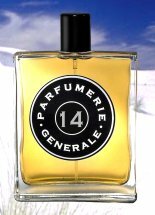 For buying information, see the listing for Parfumerie Generale under Perfume Houses. Is it possible that the perfume you are thinking of is Shiseido's Bois de Feminite? (I think that's the name). I remember that being the first perfume I ever consciously noticed a cardamon overtone…I was enthralled, although I never could bring myself to wear it. I have Iris essential oil (amateur aromatherapist)…it has a violet-like scent. Is that a common note in Iris perfumes, or does Iris have different variations? Iris Taizo reminds me of Dior Bois D'Argent. It has that similar dustiness about it. Close, it is Feminite du Bois, and that's not it but thanks for trying! It isn't the cardamom that is reminding me of something, I think, it is the dark woods & iris & resins & sweetness. Interesting. If memory serves (and I won't claim it does) I liked Bois d'Argent. I'll have to try it again. Ooh, I like these reviews of the PG line, R. Thanks! I have tested a few of them including IT. While I would not buy a number of them, they are totally original and even stunning. I will be curious to see what you say about harmatan noir. I am so glad at least one other person agrees with me on this one. I greatly admire it, but wearing it just makes my nose bleed. Better late than never … well, this turned out to be one of the few iris scents that behaves on me (Hiris is the other.) But I like its warm woodiness as a nice contrast to the stunning but very cold aspect of Hiris. Also it's very amber on me, which isn't usually my thing, but somehow works here. I would think of this as a fall scent, though — it's quite tenacious on me. All the PGs have been, so far. Love that site too, M!